The National Weather Service is forecasting significant snowfall from 3" up to 7" overnight tonight. Go slow & Be Safe! 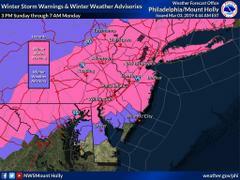 The National Weather Service is forecasting significant snowfall from 3" up to 7" overnight tonight issuing a winter storm warning for our area. Stay off the roads and park off street if possible to give DPW plows room to get their job done. Give pedestrians a break and shovel your sidewalk as soon as the weather permits. The Monday morning commute is expected to be challenging. Plan on extra time. Go slow and Be Safe! We want everybody to get to their destination safely. Snow, possibly mixed with sleet, becoming all snow after 2am. Low around 32. Light and variable wind becoming north 5 to 9 mph in the evening. Chance of precipitation is 100%. 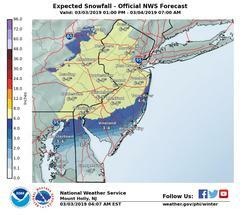 New snow and sleet accumulation of 3 to 7 inches possible.